Cheap and cheerful, Phase Motion sounds the business, boasts a decent feature set and couldn't be easier to get to grips with. Good sound. Affordable. Easy to use. Versatile. Limited presets. No envelope controls. Random mode not ideal. The phaser is the unsung hero of the studio. Used subtly, it adds dynamic life and stereo interest, and can often get sounds popping out of the mix better than any exciter. But for such a useful, ubiquitous effect, it can be oddly difficult to find a really lush plugin version. Step forward, AudioThing Phase Motion: a classic-style phaser plugin in VST/AU/AAX formats. Phasing is similar in sound to flanging (indeed, the two are often confused by producers and punters alike), but while the latter relies on a tiny modulated time difference between two copies of the same signal, phasing is - as the name suggests - about altering the phase of a signal layered on top of a dry duplicate of itself. 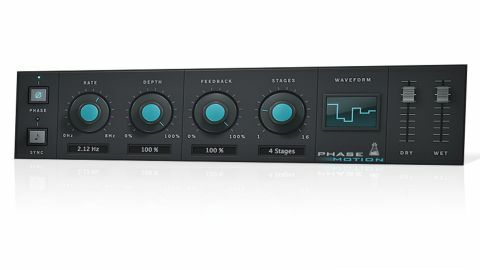 "Phase Motion might not be the most powerful phaser on the market, but it is a great-sounding, easy to use and affordable mixing tool"
A phaser does this by applying a series of all-pass filters and using (usually) an LFO to alter the phase of the processed signal, before recombining it with the dry one. Each of these all-pass filters is called a 'phaser stage', and the more of them there are, the more complex and strong the effect. Analogue models generally offer four, six, eight or 12 stages, while some popular digital models go up to 32; Phase Motion offers any number from one to 16 - more than enough for an impressively rich sound. The controls couldn't be simpler, with four main rotaries dominating the interface. Rate sets the speed of the modulation (synced from 1 bar to 1/32T, or unsynced from 0.01-8Hz), Depth controls the strength of the modulation, Feedback passes the output signal back through the phaser for a stronger effect, and Stages determines the number of all-pass filters used. Modulation is applied by an LFO, and the Dry and Wet signals each have their own level sliders. The only other control is a Phase invert switch, which flips the phase of one side of the stereo signal, generating a strong stereo widening effect. It's a modest control set but more than enough to get a wide range of phasing effects, from smooth and silky to sharp and rough-edged. It's also incredibly easy to program, which is just as well, considering the sparse preset selection. One of the less well-thought-through elements of Phase Motion is the Randomise button, which randomises every parameter of the plugin, including the wet/dry controls, often pulling one or both down very low, making it really hard to hear what any of the other randomised settings are doing! It also needs to be said that Phase Motion lacks the depth of rivals like SoundToys PhaseMistress, for example, with nothing to match that plugin's ADSR and envelope following features. Given the price differential, though, that's a fair trade. Minor quibbles aside, Phase Motion might not be the most powerful phaser on the market - or a replacement for your favourite guitar pedal - but it is a great-sounding, easy to use and affordable mixing tool that adds interest, excitement and stereo vibes to just about any signal type you care to throw at it.